I've just started another quilled marriage certificate and have been thinking a lot about the design the past few days. 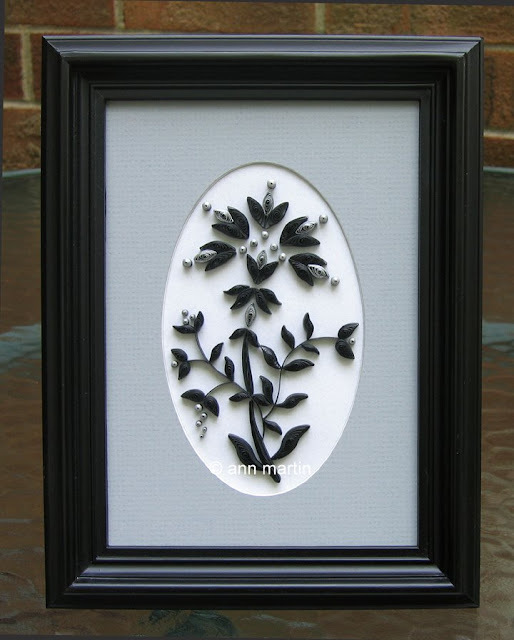 The couple requested the quilling be done in black as the text is hand calligraphed in black ink on white paper. I suggested adding a few silver gilded filigree elements to compliment the dramatic look of all black and they liked the idea, especially after I emailed pictures of previous work I'd done in black and silver. I think it helps to have a reference point, especially where color is concerned. This was one of the pieces I made for my quilling exhibit at Brandywine River Museum of Art, inspired by Indian fabric. The quilling is mounted on paper that has tiny bits of mica incorporated in it, which makes for a really pretty background. I also sent along this picture of a black script letter, embellished with silver leaves. I'd made it to dress up a special gift box after seeing an entire alphabet of leafy letters. I really like how something simple like a single letter can go such a long way in personalizing a present. 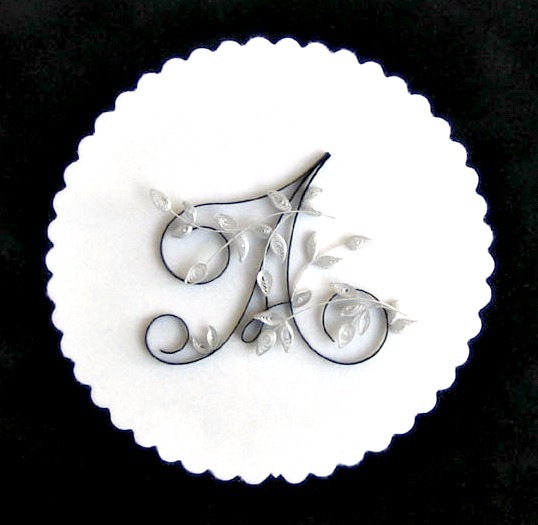 Now that I think about it, it would be a neat project to make quilled letters on a much larger scale to frame as wall art... and doing a three letter monogram would be really beautiful... hmmm, the wheels are turning... it's always good when that happens! Absolutely beautiful! The black and silver together are gorgeous! Great work! It's sooooo beautiful!!!! Absolutely great!!!! You gave me some new ideas too!!! So elegant!! And I love your A. It also gives me an idea on how to do some of the other viney letters in my Dover book! Just beautiful, I'm sure they will love it! Wow! This is so beautiful and exquisite. Real art, as always! This is beautiful. I just love the A. Where did you find the lovely letter shapes? I would love to try this for a Christmas gift for my (possibly)daughter in law. She is really into monograms. Beautiful work and so elegant in the black and silver. This monogram has been one of my all time favorites, what you do with the gilded papers is just amazing! Keep up the wonderful work, you are an inspiration to all quillers. These are all beautiful! But I especially LOVE the monogram! How perfectly pretty! As everyone else said, these are all simply beautiful! I agree also that the monogram is especially amazing. I think the simplicity of it makes it stand out so much. I come to your site via Mary's Needle N Thread, and well glad that I did. 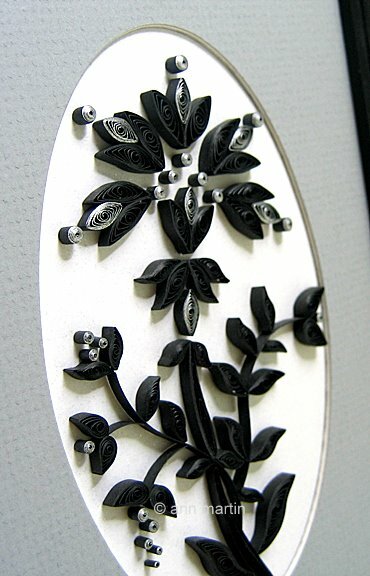 I have not even thought of quilling in decades and to come across your work has absolutely facsinated me. I can hardly afford my hobbies as is but somehow I will have to factor this in. The keys are what did me in, they are amazing! 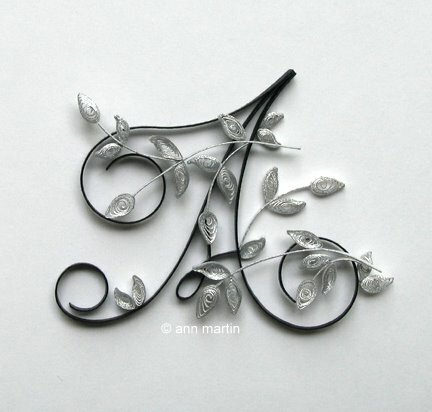 I have so much fun going over your blog, the letter with the silver leaves is just stunning. I absolutely LOVE both the framed design and the monogram. Both are stunning. Your work is always so flawless! Aw thanks Brenda! So nice to have you back among your quilling pals again. Olá, seu trabalho é maravilhoso,parabéns.